NOTE: In accordance with APNIC IP Address allocation standards, the dedicated IP must be justified, such as for an SSL cert. PCI Compliance Certification - Specialist security systems administration to establish and maintain your hosting environment to be 100% in compliance with the quarterly scanning requirements of the Payment Card Industry Data Security Standards (PCI DSS). - For all Netports Global VPS, Hybrid and Dedicated Servers. - For compliance level 3 and 4 where your environment transmits and/or processes credit card data. NOTE: Not for an environment that either temporarily or permanently stores credit card data. Please contact us for more details on this. A budget priced yet strong SSL ideal for low to medium traffic sites. 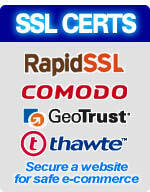 The world's most trusted SSL provider. Period. - Includes up to two (2) hours of administration time per month.